Did you know each of us has a Sacred Story? That in sharing our hearts and wisdom through stories we activate spiritual abilities and remembrances? Rev. Patricia Brooks has created a beautiful Sacred Space and community of powerful healers, teachers and practitioners who will be sharing their voices, talents, spiritual wisdom and gifts, and their Sacred Stories. 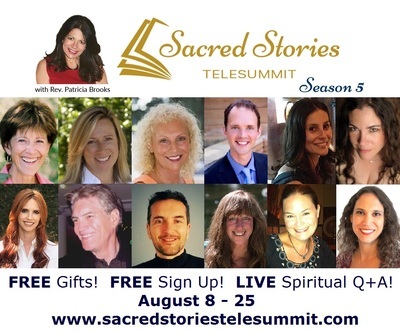 Join us for a remarkable journey, an inspiring and informative consciousness expanding 12-day event, Sacred Stories Telesummit ~ Season 5! 'Listen to my voice sing' on Aug 8th, where I'm excited and honored to share information about The Sacred Blueprint of Your Soul - Human Energy Design. Your Blueprint IS your Sacred Story, your journey into the essence of your magic and genius. Share in the Experiences of healing, clearings, activations, meditations, and more! and you can join anytime! LIVE Q+A with All of the Spiritual Teachers ~ Get YOUR Questions Answered! In sharing my voice and Sacred Story, I am also offering an exciting special offer package for Sacred Stories listeners and a new power bonus if you act quickly! Together we empower. Together we heal. Experience the collective power of our shared wisdom and experiences! BE-come Part of our Sacred Stories Community!